Past research has pointed to a possible connection between rosacea and gastrointestinal (GI) problems such as celiac disease, irritable bowel syndrome, small intestinal bacterial overgrowth (SIBO), gastritis, and ulcerative colitis. However, new evidence shows that oral doxycycline, a common treatment for rosacea, could be the cause of these GI symptoms, rather than the skin disease itself. According to recent evidence published in the Journal of the American Academy of Dermatology, patients treated with low-dose (brand name Oracea® or the generic version) or no doxycycline experienced significantly fewer GI symptoms than those treated with high- dose or “conventional dose” doxycycline. This paper reviewed data collected from rosacea patients between the ages of 30 and 64 years during an eight-year period. While there was no significant difference in GI diseases between those treated with low-dose doxycycline and those who were not treated with doxycycline at all, researchers found that high-dose doxycycline increased the prevalence of a variety of GI conditions. This suggests that the antibiotic may be the problem and not the disease itself. What Does This Mean for Rosacea Sufferers? 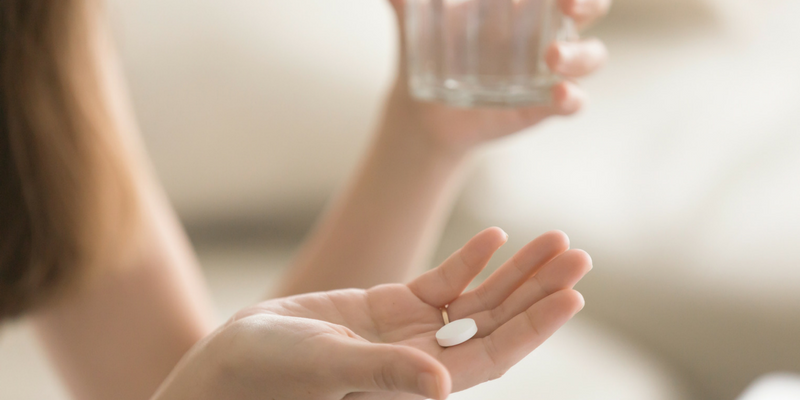 Before trying an oral antibiotic like doxycycline, talk to your doctor about starting on a topical medication such as Rhofade™ (oxymetazoline) or Soolantra® (ivermectin) first. Trying to control your rosacea with a combination of topical prescription medications like these and using the right skin care products could help you avoid the potential GI problems associated with oral antibiotics. Clinical trials for oxymetazoline cream found this treatment to be effective at reducing facial redness, even for people with moderate to severe symptoms. Rhofade is also generally well-tolerated with little to no adverse side effects. Soolantra is aimed at getting rid of high populations of Demodex mites on the skin, which have been linked with rosacea symptoms. What Is the Best Skin Care for Rosacea? Using the right daily skin care products for sensitive skin is another important step when trying to control your rosacea symptoms. Look for ingredients that help with inflammation and soothe the skin, such as argan oil, green tea, niacinamide, resveratrol, and aloe. Two great moisturizers for people with rosacea include Zerafite Barrier Repair Moisturizer and Essopi Triple Antioxidant Cream. Avoid skin care that contains irritating ingredients like fragrances, witch hazel, essential oils, and certain alcohols. Foaming and exfoliating cleansers are also not for you if you struggle with rosacea. Instead, choose a gentle moisturizing cleanser like VMV Hypoallergenic Moisture Rich Creammmy Cleansing Milk. If your skin is very dry and red, you can skip cleansing in the morning, but make sure you always wash your face at night before bed. While this is a preliminary study with some limitations, more research on this subject will undoubtedly be coming soon. Stay tuned for the latest updates on the link between oral antibiotics and GI diseases previously associated with rosacea. In the meantime, consult a board-certified dermatologist in your area if you’re experiencing new GI symptoms or are struggling to control facial redness caused by rosacea. You can also follow Baumann Cosmetic on Facebook, Instagram, and YouTube for more skin care news and advice.